So on 12/14/17 my vehicle was transported from Dallas to Round Rock; nobody told me this, but I discovered on the UVO app where it reports a 0.6 mile trip from 6:44 to 6:45 from point A in Dallas to point B in Georgetown TX. (A-B actually being 161 miles apart) At this point I do not have a timeline for this repair and I am a bit nervous about it potentially impacting some travel plans, but so far so good. This is interesting, can you clarify what parts need changing? Last edited by Nael on Sun May 13, 2018 6:04 am, edited 1 time in total. Kia have never acknowledged that there is a problem with the OBC unit so the following is entirely speculation. 1. There is a problem that maybe has a 50-50 chance of occurring in the first 4 years of owning the car. It is 'fixed' by replacing the OBC. 2. The problem is caused by hairline fractures in the cooling pipes allowing liquid coolant to leak onto the electronics. The inlet for the coolant looks like this. If this is true, then a simple fix is obvious. Don't run coolant pipes through the electronics. 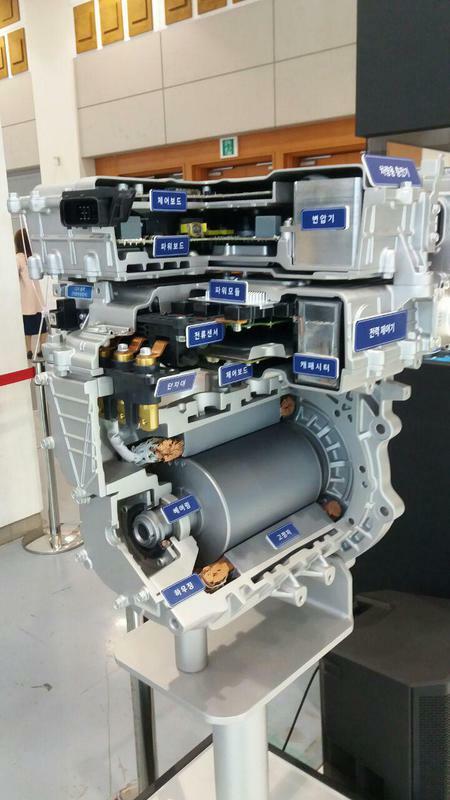 Here's a photo of the new K ona EV. 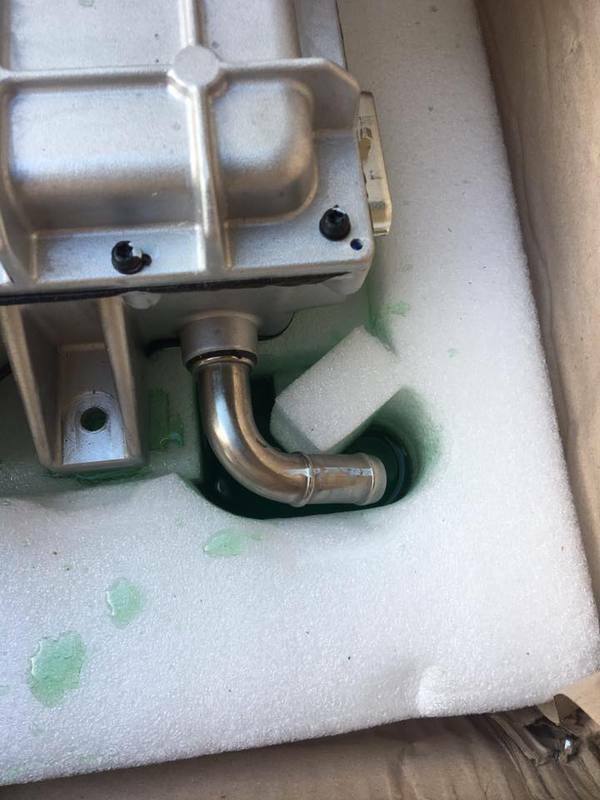 You can see the coolant reservoir (green on the right) and the water pump ( on the left). Very similar to the system on our cars. But the new motor and electronics look like this. There are no coolant pipes going into the electronics. A speculative theory is that the coolant is used to cool the battery not the OBC and EPCU. Last edited by JejuSoul on Sun Jul 08, 2018 9:27 am, edited 1 time in total. Amazing video by Rich Rebuilds showing him taking apart a T esla M odel S OBC. It is really difficult to access, and very, very difficult to take apart. They use multiple hammers and a heavy duty plasma torch! You can see the inlets for the liquid coolant. I assume it's glycol like ours, but dyed blue. There is a heavy aluminium base plate below the main unit that was firmly glued to it, the coolant lines are on the underside of the main unit. The main conclusion. The T esla OBC is over-engineered. It is much more expensive to build than ours. If it went wrong it would be really expensive to service. Our OBC however is easy to access, and to replace if something does go wrong. However the coolant lines on our OBC are inside the main unit. If it leaks, this is a major problem. It seems the number of cars requiring new OBCs is much lower than before. Perhaps most of us have had a replacement by now and these newer OBCs are working. This thread is one of the longest and probably contains the most useful info on this forum. But it is now too long for anyone to reasonably go through. Also the search functionality on this site is awful. To find anything it is quicker and more effective to use Google. Hence I am considering starting a new thread which has a first post that summarizes everything here. Until I do I will just add interesting videos I find about other EVs and the OBC to keep bumping up this thread into the list of current pages. 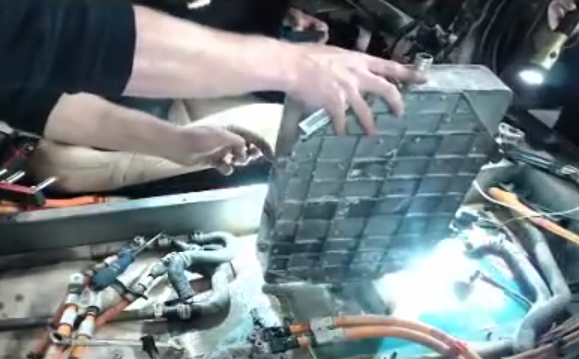 Here's an interesting video from New Zealand about fixing a faulty OBC in a N issan L eaf. In the previous cases of this fault that we are aware of, the solution was always to replace the entire on-board ch arger. However, when we were asked to diagnose and repair a 2011 N issan L eaf that had a charging fault we decided to take a look at what was actually failing in these ch argers. As it turned out, it was able to be fixed for less than a dollar worth of parts. The ch arger still needed to be completely removed from the vehicle for the repair, but that would needed to be done for a ch arger replacement anyway. We hope that this video helps other people from around the world with the same problem. 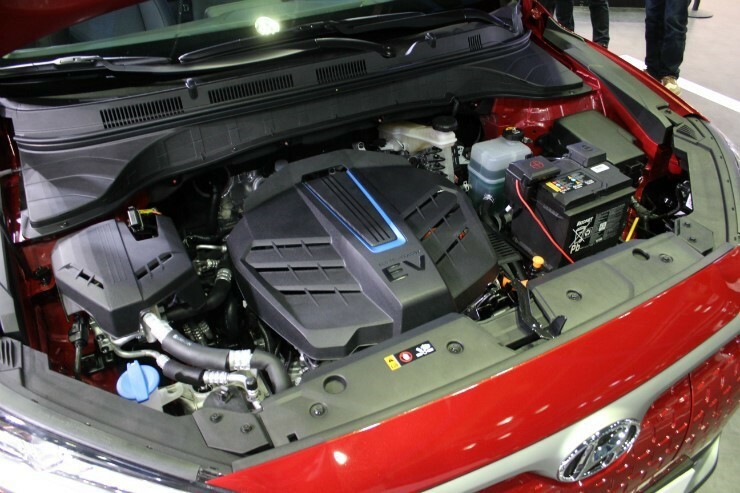 PLEASE NOTE: The high voltage system on electric vehicles needs to be treated with extreme caution - we recommend this repair is only undertaken by people with the knowledge and experience to work on these vehicles safely. Last edited by JejuSoul on Tue Aug 28, 2018 10:22 pm, edited 2 times in total. I can charge fine on CHADMO, the granny lead and also my own tethered 16 AMP home charger. Does this look like an lead issue or an OBC issue, thanks, Car is a late 15.
gally - sorry for missing your question - did you ever get it sorted?